Construction at work on papal stage for Festival of Families. 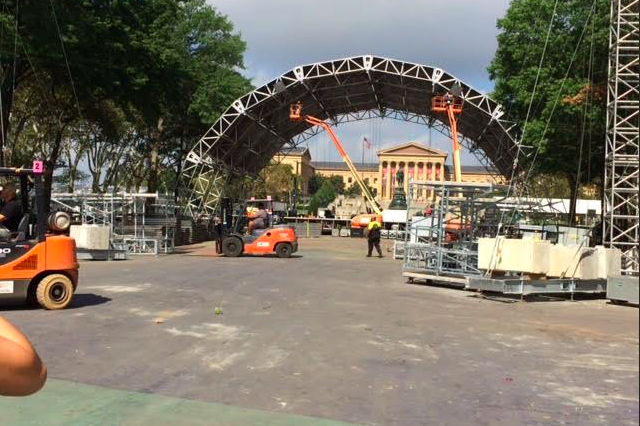 The Benjamin Franklin Parkway began shutting down Friday for its transformation. By Saturday morning, the rough outlines of the area that will be a stage next Saturday -- and a sanctuary and altar on Sunday -- had taken shape. Risers were going up. Electrical and fiber-optic cable getting strung. Trucks, hoists, and forklifts competed for lanes on the otherwise empty parkway. Food and beverage spots were moving into place. Anchors placed for Jumbatrons and speakers. In the center of the parkway’s Eakins Oval, a 100-foot arch, 85 feet deep, already dominated. A temporary stage in use for one weekend, it will in many ways be a world stage, with the Philadelphia Art Museum as its backdrop. All was in preparation for Pope Francis’ appearance here next weekend. When the work peaks, as many as 2,000 workers will be toiling simultaneously on the parkway. On Saturday, about 500 were already busy. Now the number everyone wants to know: There will eventually be 3,300 portable toilets in place on the parkway. 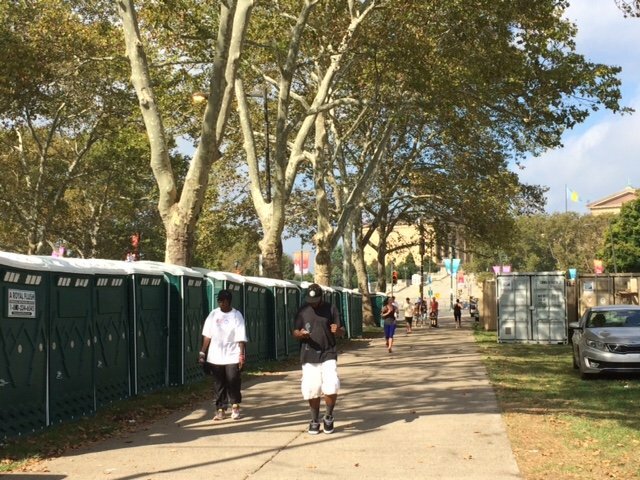 Row of portable toilets along the Parkway (Kevin Shelly/PhillyVoice). That’s a number decided by “a science,’’ according to Scott Mirken, president of ESM Productions, and the executive producer of the events planned on the parkway by the World Meeting of families and the Vatican. Mirken said the bulk of the work will be done by Thursday. Fine-tuning will be going on right up until the last minute on Saturday, the moment he called “doors” when the pope finally takes the stage along with the Philadelphia Orchestra, dancers, and performers. Complicating logistics, the stage will convert to a holy place overnight as liturgical elements replace the stage, said Mirken, a makeover that will happen in fewer than 12 hours. The rain-or-shine event depends on banks of radios, not cell phones, said Mirken, with back-up landlines, hardline phones, and a small number of satellite phones, said Mirken. He dodged answering a question about cost. But Mirken said the outdoor events infrastructure represents about 25 percent of the entire costs of the events that begin Tuesday with the World Meeting of Families at the Convention Center. Meanwhile, as the parkway was transformed, volunteers —there are 4,000 -- lined up at the Convention Center for uniforms on Saturday.